The complete Beacon Book is here, except the telephone numbers have been removed. You will find them only in your printed copy, in the interest of personal security. 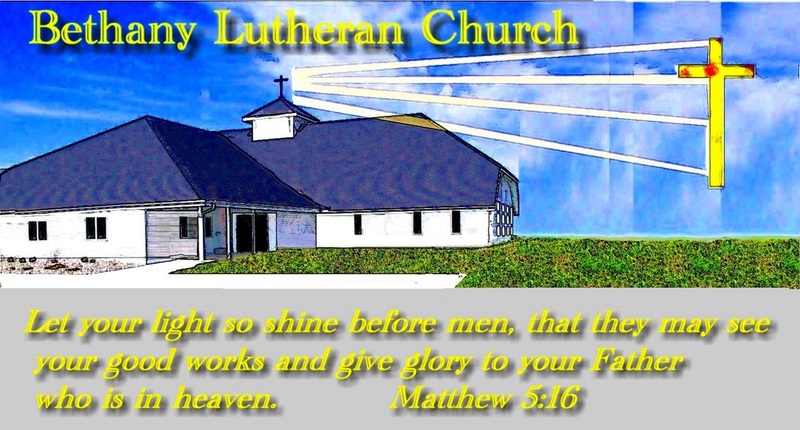 Each family/member of Bethany Lutheran Church is given the opportunity to share and be a part of the congregational events and other services which Bethany offers to it's member. Every family picks the two months during the year that they will be able to help. If they don't pick themselves, the months will be assigned for them. There are leaders of each Bethany Beacon group to help organize the duties for each month. Each group meets the 3rd Sunday of the month prior to their assigned month. They are to contact each family to ask which job they would like to do during the month. After they fill all the jobs, the leaders give the list to the church secretary. The secretary will then type up a calendar and mail it to each family. Bethany Beacons are a way in which we can all contribute to the warmth and effectiveness of the ministry of our church. Participation by everyone in some meaningful way gives a feeling of satisfaction, belonging and significance in the Family of Bethany and will be a blessing for you and your family, as well as those you serve. Thank you for your willingness to serve. Your work is appreciated. It provides an opportunity to serve others and, in doing so, to serve our Lord. The following is a guideline for the various events and services at Bethany. Two ushers are needed for each service. 1. Arrive at the church one-half hour before service begins. 2. Greet and hand out bulletins to those who would like them. 3. Light the candles before and after service if there are no candle lighters. 4. Receive offering from the front to the back of the church. 5. Usher people to the communion table on communion Sunday. 6. At the close of the service, the ushers go down the center aisle, ushering people out, front to back. 7. After service, clean up pews and chairs and put hymnals in place. Read first and second lessons from the lectern using the microphone. Lessons are found in the pew Bibles. Youth will light the candles each Sunday and put them out at the end of the service. They also light the baptismal candle when a baptism is scheduled and the Advent candles during Advent. 1. Start coffee approximately one-half hour before the service. 2. Prepare one 55 cup coffee pot using 1 ½ cups of coffee or one 36 cup coffee pot using one cup of coffee. 3. Prepare 4-6 pitchers of Kool-Aid. 4. Place cups, napkins, creamer, sugar and spoons on serving counter. 5. Clean up and put away supplies and coffee pots after serving. 6. Cookies, bars, doughnuts, etc., may be served if group so desires. Assistants are selected for the 1st & 3rd Sundays. Communion supplies are in the cupboard in the small kitchen located in the Gathering Room (room off the office). Wine is kept in the secretary's office cupboard next to the copier. 2. Place wafers on the serving tray. 3. Fill communion cups with wine. Leave one tray empty to pickup the empty cups. 4. Assistants will carry up communion before the ushers with offering. 5. Pastor distributes wafers. Wine is distributed and picked up by the assistants. 6. Clean up communion trays after service. 7. If supplies are low, leave a note on the secretary's computer. Information on these special events will be given to the Beacon Leaders when necessary. Information will be given to the group leaders prior to a potluck. 1. Leaders will be in charge of how they want to handle the potlucks. 2. Setup and cleanup will also be handled by the monthly Beacons. Christian education classes meet Sunday mornings at 9:30 am for ages 4 through the 9th grade. Students are given the opportunity to know Jesus and his love and to experience joy in Christ’s teaching. Children of our congregation learn more of the faith that is theirs and how to relate that faith to daily life in the formation of their lifetime values. One week of Vacation Bible School is held during the summer vacation. The Funeral Chairperson is contacted by Eric Johnson or Pastor Graff. They will then contact members of Bethany to help by working in the kitchen or bringing salads or bars. Bethany has always provided great comfort and support during times of illness, death, and grief. Providing a meal after a funeral allows time for fellowship and a healing process to begin. Confirmation years at Bethany include seventh, eighth and ninth grades. Weekday classes on Wednesday and Sunday School teach the confessions of the Lutheran Church, Biblical history and a growing understanding of the confirmands’ faith in Jesus. The Bible studies will meet as circles on the third Wednesday morning or the third Wednesday evening. WOW general meetings are held every other month. The bulletin and newsletter will give information about places, study leaders and servers for circle and WOW meetings. The Evangelical Lutheran Church Women is a constitutionally sanctioned auxiliary of the Evangelical Lutheran Church and provides study, fellowship and leadership to Bethany Lutheran and the church-at-large. The men at Bethany Lutheran gather each Thursday morning in the church kitchen to share breakfast, fellowship and Bible Study. The Thursday gathering provides an inspirational way to begin the day. Women of Bethany Lutheran gather each Wednesday morning in the church kitchen to share breakfast. This is followed by fellowship and Bible Study in the Gathering Room (room off offices). All ladies of the community are invited to share in this study. The Youth Group consists of youth members in grades 7-12. This group participates in local, district and national events that celebrate the faith of youth. Parents are required to help with chaperoning and transportation as needed. Bethany contemporary group, Lighthouse, leads the worship service in music every 3rd Sunday. During the contemporary service, songs are often sung from the berry colored, “Praise and Worship” book. .